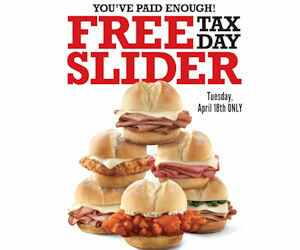 Alleviate some of that Tax Day stress at Arby's! Print this coupon to get a free slider of your choice! No purchase necessary! Valid today only, April 18th. Available for residents of OK, AR, IL (greater STL area), KS, MO, CO, ID & WY only.